Talented Ga rapper and BardMan Family frontman, Tinny is outa the kitchen with a sizzling hot musical delight that doesn’t just show how far he has come and how good he is gotten but also treats fans to an amazing listening experience. Titled “Lorgorligi”, the new song from Tinny is a delight to listen to and scores the feature of Uptown Energy‘s Yaa Pono with production credits going to Bizkit Beatz. Osu-born Tinny is not a stranger to Ghanaian music circles but while his passion for doing music may have started from his days in secondary school where he was the entertainment prefect, he didn’t make his break into the industry until the release of “Makola Kwakwe” in 2003. Not resting on his oars, Tinny whose real name is Nii Addo Quaynor featured on Obrafour‘s remix of his hit single, “Oye Ohene” to further increase his rep in the industry. Tinny has collaborated with top artistes like Dogo, Obrafour, K.K. Fosu, Etuoaboba, Bandana, FBS and Okra and released songs like “Dzomo”, “Obi Do Ba”, “Zingolo”, “We Still Dey”, “Blema Bii” amongst others and has countless awards and nominations to show for his persistence. His collaborator on the track, Yaa Pono started the year with the release of “Style” on which he featured Samini. In early March, he released “Fake” and later in the month, collaborated with Stonebwoy to release “Obia Wone Master”. May saw him join forces with Bayku and M.anifest on “Don’t Follow Me” and in June collaborated with Fancy Gadam and others on “I’m Black Star” before last month’s feature on Joey B‘s “Beautiful Boy” alongside Wanlov. 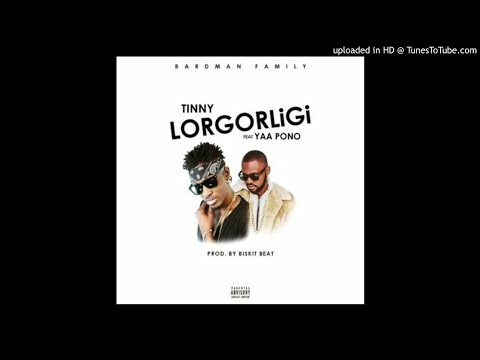 Another feature on Tinny‘s “Lorgorligi” can only be a good thing for him. To enjoy the new song, stream or download below and drop your comments.